In Weston-Super-Mare a Garden of Fragrance was being planned for the partially sighted and blind. Specially chosen fragrant plants and herbs were planted and the Inner Wheel, a local ladies’ group, decided that they would like to contribute to the garden by commissioning a piece of sculpture. The sculpture was to have a tactile quality and also rich tonal contrasts so that both the blind and the partially sighted might enjoy the surfaces and the imagery. 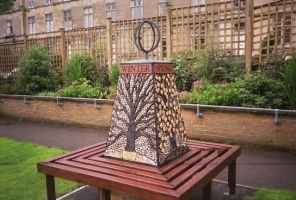 Working in co-operation with our friend and working partner James Blunt, we designed an obelisk with each of the four sides representing one of the four seasons. A formalised tree is shown on each side. With blossom the tree represents Spring, Summer by stylised green leaves, and terracotta leaves and bare branches represent in turn Autumn and Winter. Engraved lettering names each season and pebbles form the backing to give a richly textured surface overall. We wanted people to feel the surface as well as to look at it. James designed a simple piece of ironwork to surmount the panels, again encouraging visitors to touch the sphere. The ceramic and stone obelisk has survived well over the years but unfortunately vandals damaged the ironwork which had to be removed.